Deeper Learning in Christian Education: Deeper Learning into What? For good reason, when people talk about learning in schools, the conversation usually involves language of deeper learning. The idea of deeper learning can be traced back to the Hewlett Foundation and is generally aimed at ensuring “students compete globally and become engaged citizens at home” (“Deeper Learning”). Appropriately and to the benefit of Christian education, many Christian schools have responded to the aims of deeper learning and have been exploring how to implement teaching practices that develop twenty-first century competencies—collaboration, communication, critical and creative thinking, growth mind-set, directing one’s own learning—among teachers and students. Our friend and fellow deeper learner Steven Levy has created helpful charts that compare the aims of the Hewlett Foundation’s six competencies of deeper learning to the aims of Christian schools (see “Deeper Learning in Christian Schools”). 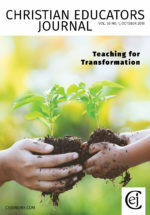 Following Teaching for Transformation (TfT), many Christian schools have also begun a journey of implementing pedagogical approaches from groups such as Expeditionary Learning Education and project-based learning as promoted by the Buck Institute. Furthermore, organizations such as the Center for Advancement of Christian Education (CACE) sponsor annual gatherings for Christian educators to grapple with the ideas and implementation of deeper learning practices. For Christian schools actively involved in implementing deeper learning practices, the design of learning experiences has significantly shifted. In fact, deeper learning demands teachers become experts in learning design. (Many stories about this process have been shared in this CEJ issue on TfT.) This is to be celebrated. As Christian schools explore and implement deeper learning practices within the classroom, questions are raised: Does the deeper learning conversation in Christian schools need to be a different type of conversation? Should deeper learning in Christian schools be distinct? If so, how? Deeper learning into what? With this in mind we, along with Australian learning leaders, were invited to grapple with these questions at the Christian Education National organization’s first-ever teaching and learning conference (see “Parallel Conferences”). In preparation for and during our work there, we proposed a working definition of deeper learning in Christian education: People of God’s story engaged in real work that forms self and shapes the world. This definition of deeper learning guides how we design learning within the TfT framework and within the Ontario Alliance of Christian Schools (OACS). This article will explore the three main facets that make up this definition. There are many stories at work within a school—the story of being socially accepted, the story of achieving good grades, the story of handing your schoolwork in on time, the stories of compliance and engagement. And, for good and bad, participating in these stories shapes us and deeply roots what we value and desire in our lives. As Sarah Arthur writes in the book Shaped by God, “We are story-formed people. Our lives are first shaped by narrative, not by information” (38-39). So, as deeper learning suggests, shaping or forming a human being is less about the what (i.e., curriculum) of school and more about the stories that the curriculum is part of. James K. A. Smith echoes this in his book You Are What You Love: “A Christian education can never be merely a mastery of a field of knowledge or technical skills; learning is embedded in a wider vision of who I am called to be and what God is calling the world to be. How does my learning fit in this Story? And what practices will cultivate this ultimate orientation in me?” (164). The pursuit of deeper learning in Christian schools must be anchored in the story that we are part of. Our curriculum finds its meaning and purpose within God’s unfolding story: a story of redemption that invites us to participate, to cocreate with God, in the restoration of a broken but beautiful and delightful world. Deeper learning brings us deeper into this story. Those nitrate and phosphate measurements in the stream study? Part of God’s story of making all things new again. The study of conflict and war through history? Part of the same story. The writing of poetry and music, the study of the stars, and that timeless PE game of dodgeball? It’s all part of the same story. And without this story, it is simply stuff. While the deeper learning goals described by the Hewlett Foundation (to ensure “students compete globally and become engaged citizens at home”) are consistent with the hopes of our students and parents, they fail to recognize the epic purpose and story we are part of. Our students—these curious, passionate, desiring students—were created to participate in the epic of God’s unfolding story of redemption. Our students and teachers are the people of God’s story. And God’s story is not out there or later upon graduation—it is here and now. So in Christian education, deeper learning means inviting our students to play their role in God’s story every day and in every class—it is the story contained in the distinctive promises of our Christian schools’ mission and vision statements.